Russell Lewis "Russ" Abbey was born May 9, 1882, in Byron, Fond du Lac Co., WI, and died October 13, 1946, at Saint Mary's Hospital, Rhinelander, Oneida Co., WI, at age 64. Buried in Block 23, Lot 2, Grave A, Forest Home Cemetery, Rhinelander, Oneida Co., WI. He is the son of Wellington Abbey of Clarke Twp., Newcastle Dist., Durham Co., Canada West, and Laura Estella Watrous of New York. Agnes Anna Schmidt was born August, 1884, in the Village of Dorchester, Mayville Twp., Clark Co., WI, and died August 29, 1961, in Rhinelander, Oneida Co., WI, at age 77. Buried in Block 23, Lot 2, Grave B, Forest Home Cemetery, Rhinelander, Oneida Co., WI. She is the daughter of August Frederick Schmidt of Sheboygan Falls Twp., Sheboygan Co., WI and Bertha Kolberg of Wisconsin. Russell Lewis "Russ" Abbey (age 22), a bachelor, and Agnes Anna Schmidt (age 20), a maiden, were married Sept. 21, 1904, in Dorchester, Clark Co., WI. Vivian E. Abbey: Born November 17, 1905, in Rhinelander, Oneida Co., WI; Died December 25, 1984, in Portland, Multnomah Co., OR (age 79). Buried in Forest Home Cemetery, Rhinelander, Oneida Co., WI. Married December 15, 1940, in Rhinelander, Oneida Co., WI, to Dexter William Stefonek: Born January 31, 1918, in Wisconsin; Died November 19, 1985, in Glendive, Dawson Co., MT (age 67). Buried in Forest Home Cemetery, Rhinelander, Oneida Co., WI. Truman Dale Abbey: Born January 6, 1920, in Rhinelander, Oneida Co., WI; Died May 21, 1967, at Saint Mary's Hospital, Rhinelander, Oneida Co., WI (age 47). Buried in Saint Mary and Joseph Catholic Cemetery, Rhinelander, Oneida Co., WI. Married August 16, 1947, in Rhinelander, Oneida Co., WI, to Marion Mary Pospychala: Born March 11, 1919, in Rhinelander, Oneida Co., WI; Died April 3, 1987, at Saint Mary's Hospital, Rhinelander, Oneida Co., WI (age 68). Buried in Saint Mary and Joseph Catholic Cemetery, Rhinelander, Oneida Co., WI. The 1880 U. S. Census taken on June 8, 1880 shows August F. Smith (age 22) born in Wisconsin to Prussian-born parents is a Farmer living in Mayville Twp., Clark Co., WI. Living with him is his wife, Bertha Smith (age 21) born in Wisconsin to Prussian-born parents, who is Keeping House. Also living there is his daughter, Eida Smith (age 2/12, April) born in Wisconsin to Wisconsin-born parents. William Smith (age 28) born in Wisconsin to Prussian-born parents is a Farmer living on the adjacent farm. The 1880 U. S. Census taken on June 7, 1880 shows Wellington Abbey (age 40) born in Canada to Canadian and Irish-born parents is a Farmer living in Byron Twp., Fond du Lac Co., WI. Living with him are his wife of Laura Abbey (age 34) born in New York to Massachusetts-born parents, who is Keeping House. Also living there are children, all born in Wisconsin to Canadian and New York-born parents: George Abbey (age 11); Bert Abbey (age 7); and Edith Abbey (age 5). Two servants are also living in the household. Russell Lewis Abbey was born May 9, 1882, in Byron Twp., Fond du Lac Co., WI. Agnes Anna Schmidt was born August, 1884, in the Montown, Village of Dorchester, Mayville Twp., Clark Co., WI. The 1900 U. S. Census taken on June 19, 1900 shows Wellington Abbey (age 59) born April 1841 in English Canada to Canadian and Irish-born parents and having emigrated in 1848 and a Naturalized citizen is a Farmer owning his own farm free of a mortgage and is living in Byron Twp., Fond du Lac Co., WI. Living with him is his wife of 34 years, Estella L. Abbey (age 44) born November 1855 in New York to Scottish and Massachusetts-born parents, with 3 of the 6 children born to her still alive, who does Housekeeping. Also living there is his unmarried son, Louis R. Abbey (age 18) born May 1882 in Wisconsin to Canadian and New York-born parents, a Farm Laborer. An unmarried Farm Laborer Servant also lives in the household. The 1900 U. S. Census taken on June 28, 1900 shows August Schmidt (age 42) born February 1857 in Wisconsin to German-born parents is a Machinery Agent owning his own home free of a mortgage and living in Mayville Twp., Clark Co., WI. Living with him is his wife of 22 years, Bertha A. Schmidt (age 41) born August 1858 in Wisconsin to Wisconsin-born parents, with 4 of the 6 children born to her still living. Also living there are his three children, all born in Wisconsin to Wisconsin-born parents: Annie Schmidt (age 15) born August 1884; Sarah Schmidt (age 11) born October 1888; and Hattie Schmidt (age 7) born June 1892. Also living there is his unmarried nephew, William Schmidt (age 24) born October 1874 in Wisconsin to German and Wisconsin-born parents, who is a Fireman at an Engine. Wellington Abbey died September 23, 1901, in Fond du Lac Co., WI, at age 61. He was buried in Byron Cemetery, Byron Twp., Fond du Lac Co., WI. The 1905 Wisconsin State Census taken on June 1, 1905 shows August Schmidt (age 47) born in Wisconsin to German-born parents is a Beer Agent owning his own home with a mortgage and living in the Village of Dorchester Twp., Clark Co., WI. Living with him is his wife, Bertha Schmidt (age 46) born in Wisconsin to German-born parents, who is a Housekeeper. Also living there are his two unmarried daughters, both born in Wisconsin to Wisconsin-born parents: Sarah Schmidt (age 16); and Hattie Schmidt (age 12). Russell Abbey is again in charge of the Krueger photograph gallery. Mr. Abbey is an experienced photographer who thoroughly understands every detail of the business. His work is attracting unusual attention and is eliciting much favorable comment. 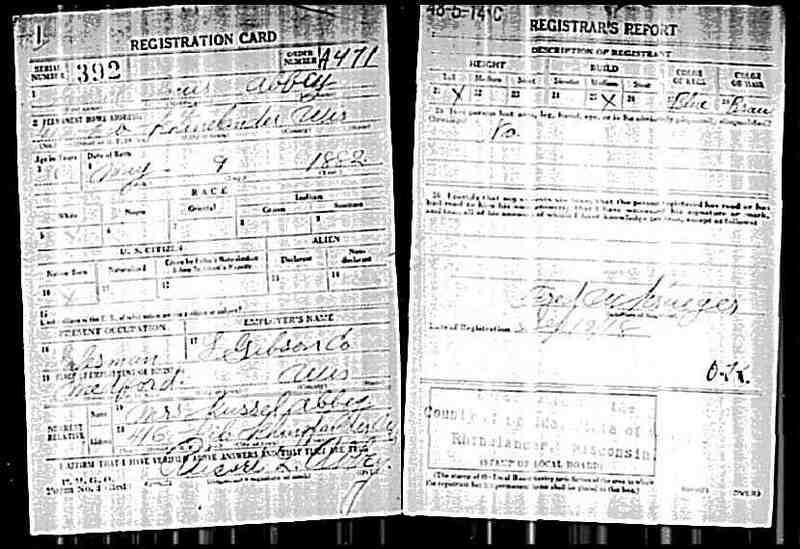 The 1910 U. S. Census taken on May 5, 1910 shows Russel Abbey (age 27) born in Wisconsin to Wisconsin-born parents is a Gallery Photographer who owns his own home free of a mortgage and lives at 416 Rib Street, 3rd Ward, City of Rhinelander, Oneida Co., WI. Living with him is his wife of 5 years, Agnes Abbey (age 25) born in Wisconsin to Wisconsin-born parents, with the only child born to her still alive. Also living there is his daughter, Vivian Abbey (age 5) born in Wisconsin to Wisconsin-born parents. There is another family renting from them who lives at that address. The 1914 Rhinelander Street Directory: West side of street, 416 Rib Street, R L Abbey (owner). The 1914-1915 Rhinelander City Directory: Abbey Russell L (Anna), clk, 416 Rib. Russell Abbey leaves Friday morning for Minneapolis where he takes a position as traveling salesman in Wisconsin territory for the Deere & Weber company. Although he will be on the road most of the time his family will continue to reside in Rhinelander. For five years Mr. Abbey has been in the employ of the T. C. Wood Hardware company as farm machinery demonstrator. He is fully qualified to assume the duties and responsibilities of his new position. 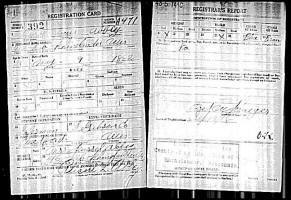 On September 12, 1918, the WWI Draft Registration Card and Registrar's Report at Rhinelander, WI shows Russel Louis Abbey was judged No. 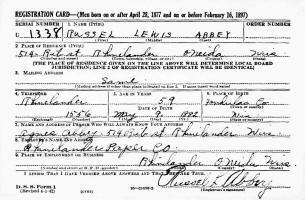 Russel L. Abbey signed his name on the form. Tall Height, Medium Build, Brown Hair and Blue Eyes. He was employed as Salesman at the L. Gibson Co. in Medford, WI. He was living at 416 Rib Street, Rhinelander, WI. His wife was his nearest relative. The 1920 U. S. Census taken on January 7, 1920 shows Russell Abbey (age 38) born in Wisconsin to Canadian and Wisconsin-born parents is an Automobile Salesman owing his home free of a mortgage and living at 416 Rib Street, 3rd Ward, City of Rhinelander, Oneida Co., WI. Living with him is his wife Anna Abbey (age 36) born in Wisconsin to Wisconsin-born parents. Also living there is their daughter Vivian Abbey (age 14) born in Wisconsin to Wisconsin-born parents. August Frederick Schmidt died February 23, 1929, at the home of his son-in-law and daughter, 416 Rib Street, Rhinelander, Oneida Co., WI, at age 81. Came Here Week Ago, Passes Away at Home of Daughter. August Schmidt, 71 years of age is dead at the home of his daughter, Mrs. Russell Abbey, of 416 Ribb street. Mr. Schmidt came to Rhinelander only a week ago. His health had started to fail, and his daughter intended that he make his home here with her. His condition did not become serious, however, until Friday. Death was due to dropsy. The body was shipped over the Soo line on Wednesday morning to Dorchester, Wis., where funeral services will take place. Mr. Schmidt was born in Sheboygan on Feb. 3, 1858, and had lived in Wisconsin all of his life, engaging in farming near Dorchester until recently. His wife preceded him in death. Our old friend, A. F. Schmidt, early settler of Dorchester, Clark County, Wis. Died last Saturday at the home of his daughter, Mrs. Russell Abbey, and was brought to Dorchester and buried Wednesday afternoon from the evangelical Church, of which he was a charter member, Rev. F. P. Walter officiating and interment was made in the cemetery south of town, O. R. Hiedtke, G. R. Broeske, M. Papesch, Herman Kaage, Oscar Schroeder and Hy. Gipp acting as pallbearers. August F. Schmidt, son of Mr. and Mrs. August Schmidt, was born in Sheboygan Falls, Feb. 3, 1858, and was 71 years and 20 days old at time of death. He was one of 10 children, of which there are only three remaining, G. F. Schmidt and Mrs. Hy. Glenzer of this village, and Mrs. Fred Wickham of Oshkosh. Mr. Schmidt spent his early life on a farm near Sheboygan Falls, engaging not only in farming, but in the carpenter’s trade as well. On the 15th of November 1877 he was united in marriage to Miss Bertha Kolberg, a sister of Mrs. G. F. Schmidt and a daughter of Christian Kolberg of Sheboygan Falls. Five children were born to them, two of which with the mother have preceded him in death. One daughter, Minnie, died when little, and Sarah (Mrs. Fred Dornenberg) died about 20 years ago. In 1878 he moved to Dorchester and 1887 to Chelsea, but came back to Dorchester a year later and started to manufacture broom handles and toys, and also ran a feed mill. Here he lived, except for a short while they were at Abbotsford and Thorp, where he had a meat market. About 10 years ago Mrs. Schmidt died and 5 years ago he went to live on a farm near Exeland, but owing to poor health went to live with his youngest daughter, Hattie. About a week before he died he went to Rhinelander to the home of his daughter, Agnes, that he might have better medical treatment, not realizing that only a few more days were his to live, though he had assured his loved ones, “I am ready to die any time now.” He passed away at 5:25 p.m. Saturday leaving his three daughters, Mrs. Ida Scott of Chetek, Mrs. Agnes Abbey of Rhinelander, and Mrs. Hattie Beyreis of Exeland, 7 grandchildren and a brother and 2 sisters already mentioned, besides other relatives and a host of friends to mourn his loss. He was a large hearted man with a faculty for making friends wherever he went that probably accounts for his political success, for he was town chairman and at the time of his death was the town treasurer, which office his daughter, Hattie, will have until the term expires. Thus ended a long and useful life and he walks among his friends no more but faith will bridge the chasm and we can see the happy meeting when we are all gathered home to be with Him who gave His life as a ransom for us. 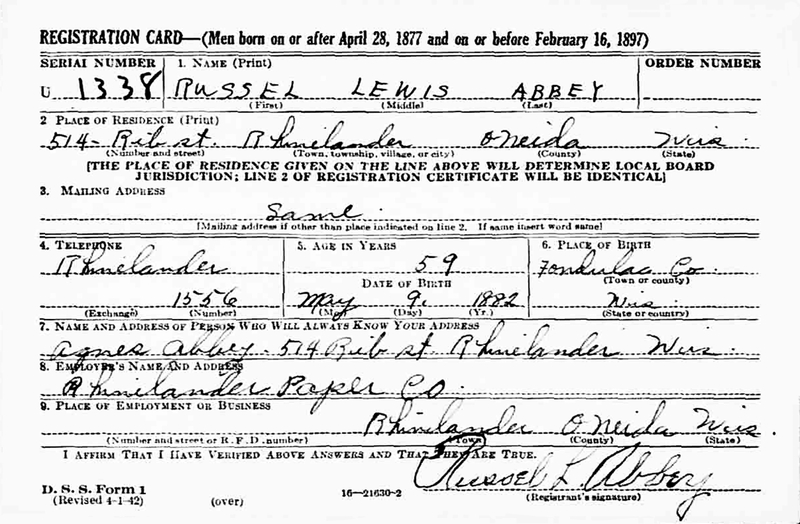 The 1930 U. S. Census taken on April 19, 1930, shows Russell L. Abbey (age 47) born in Wisconsin to Canadian and New York-born parents and first married at age 22 is an Acid Maker in a Paper Mill who owns his home and is living at 416 Rib Street, Third Ward, Rhinelander, Oneida Co., WI. Living with him is his wife, Anna A. Abbey (age 45) born in Wisconsin to Wisconsin-born parents and first married at age 20. Also living there are his two unmarried children, both born in Wisconsin to Wiscoonsin-born parents: Vivian Abbey (age 24), a Saleslady at a Store; and Truman Abbey (age 10). The 1940 U. S. Census taken on May 1, 1940, shows Russell Abbey (age 57) born in Wisconsin and 5 years ago was living in the Same Place and with 1 year of High School is a Laborer at a Paper Mill who owns his home worth $3,000 and is living at 514 Rib Street, 8th Ward, Rhinelander, Oneida Co., WI. Living with him is his wife, Agnes Abbey (age 55) born in Wisconsin and 5 years ago was living in the Same Place and with 8 years of School. Also living there are his two unmarried children: Vivian Abbey (age 34) born in Wisconsin and 5 years ago was living in the Same Place and with 4 years of High School, a Retail Store Clerk; and Truman Abbey (age 20) born in Wisconsin and 5 years ago was living in the Same Place and with 4 years of High School. Russell Lewis Abbey died October 13, 1946, at Saint Mary's Hospital, Rhinelander, Oneida Co., WI, at age 64. He was buried in Forest Home Cemetery, Rhinelander, Oneida Co., WI. Russell L. Abbey, 514 Rib Street, a resident of Rhinelander for 43 years, died Sunday morning at 9 o'clock at St. Mary's Hospital following an illness of two weeks. He was 64. Born May 9, 1882, at Fond du Lac, he moved here in 1903. On Sept. 21, 1904, he was married to Agnes Smith at Dorchester, Wis. He began work at the Rhinelander Paper Company in June, 1920. He was an assistant in the personnel department. He was a member of the Rhinelander Paper Company band and served as librarian of music and custodian of instruments. Before working in the paper company, he was a proprietor of the Aker-Abbey garage. Mr. Abbey was a member of the Methodist Church. He is survived by his wife; one daughter, Mrs. Dexter Stefonek, of Rhinelander; one son, Truman, of Rhinelander; one sister, Mrs. Anton Kuen, of Brownsville, Wis.; and one grandchild. Funeral services will be held Tuesday at 2 p. m. at the Abbey residence. The Rev. M. H. Cloud will officiate. Burial will be in Forest Home cemetery. Friends may call at the home after 7 p. m. Monday. Agnes Anna (Schmidt) Abbey died August 29, 1961, in Rhinelander, Oneida Co., WI, at age 77. She was buried in Forest Home Cemetery, Rhinelander, Oneida Co., WI. ABBEY, Mrs. Agnes, was born in Dorchester, Wis., Aug. 16, 1884, and passed to her rest Aug. 29, 1961, at Rhinelander. She was a charter member of the first organized company of Seventh-day Adventists in Rhinelander. She remained a faithful and loyal cheuch member through the years. 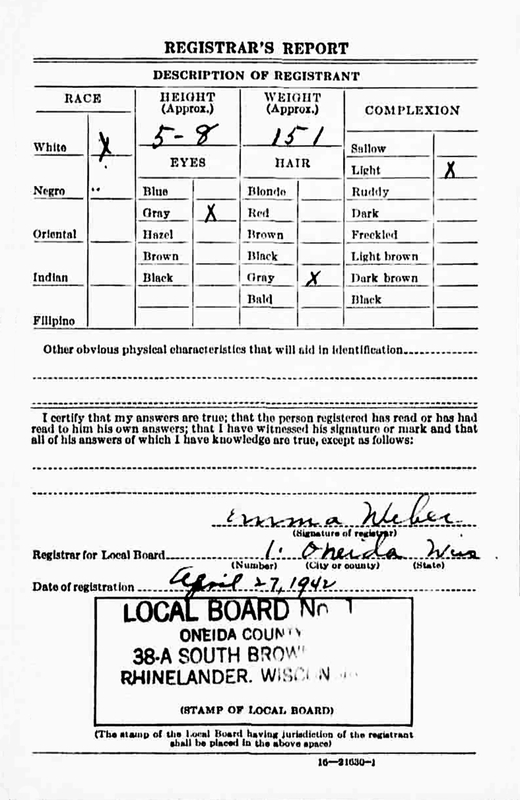 She is survived by a daughter, Mrs. Dexter (Vivian) Stefonek, and a son, Truman Abbey, both of Rhinelander; a sister, Mrs. Hattie Beyreis of Exeland, Wis.; and twograndchilden. Her husband, three sisters, and two brothers preceded her in death. Funeral services were conducted in the Rhinelander Seventh-day Adventist church by the writer, and burial was made in Forest Home Cemetery, where Sister Abbey awaits the call of the Life-giver.